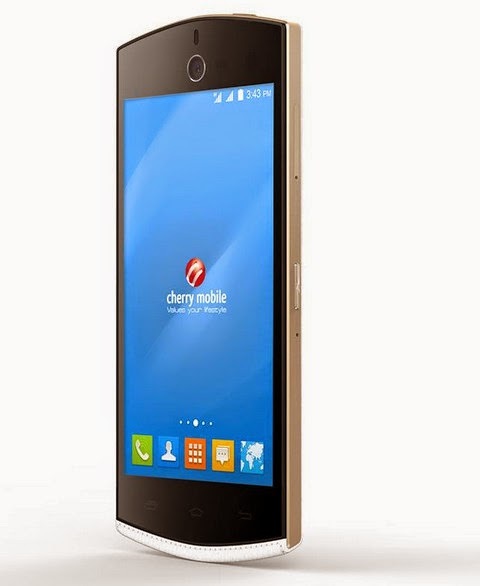 2014 is turning out to be the biggest year for Cherry Mobile thus far. Within the past twelve months, in partnership with Microsoft Corporation and the Mozilla community, the local electronics giant has been able to release devices running on multiple platforms including Windows Phone, Windows 8.1, and Firefox on top of Android, with which they've experienced tremendous success since 2010. CM is practically the first and only Pinoy handset maker to have mounted such a feat. Aside from that, company has had more than a handful of best-selling devices this year including Cherry Mobile Flare 3, Alpha Luxe, Cosmos One, Omega Icon, the G2 smartwatch and even the Alpha Morph tablet which transforms into a laptop -- among many other stellar releases. Talk about record sales. 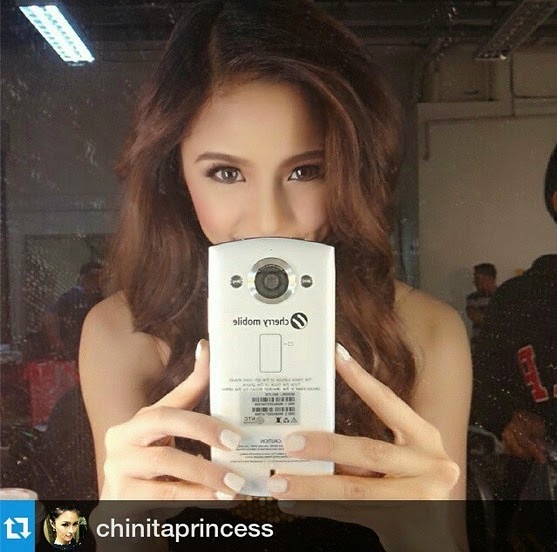 It's clear then that the freshly outed Cherry Mobile Selfie - shown in the photo above being used by Kapamilya flagship talent and Cherry Mobile celebrity endorer Kim Chiu to take a photo of herself in front of the mirror (or a mirfie) - will merely serve as an icing on the company's already very tall cake if and when it becomes a hit this Yuletide season. 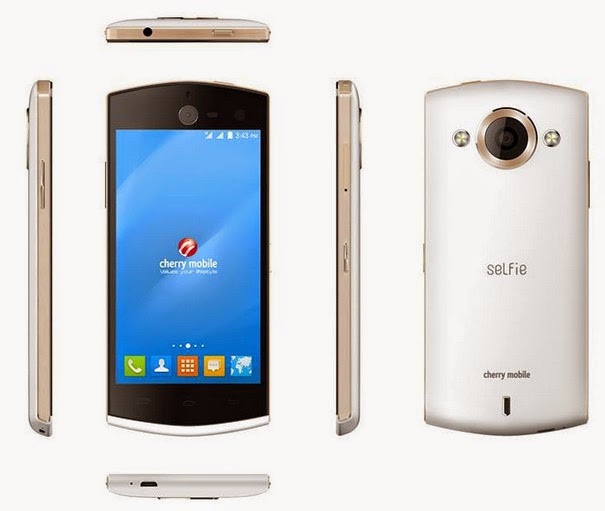 Priced at only Php 9,999, Cherry Mobile Selfie could very well be considered the best cameraphone that CM has released to date. This 4.7 HD handset features a 13 MegaPixel autofocus camera at the back with Dual LED flash and Sony's IMX135 back-illuminated sensor for improved low light performance and has another 13 MP autofocus camera in front with soft, single LED flash and the same IMX135 sensor helping it deliver the best selfies from any Cherry Mobile smartphone to date. The design identity of the phone itself, which is a reminiscent of a digital camera, reinforces the fact that great mobile imaging features are its strongest suit. But what really makes this particular release one of the very best selfie phones out there is that, apart from its amazing front-facing camera hardware, it also features CM's new Beauty+ app which allows users to further enhance their self-photos with up to 5 levels of 'beautification' -- letting you even out your skintone, remove blemishes, and add an attractive glow to your skin. Aside from having stellar imaging capabilities, Dual SIM Dual Standby Cherry Mobile Selfie also comes with powerhouse internal specifications that should put a smile on the face of even the most demanding mobile gamer. The handset runs vanilla Android 4.4.2 KitKat operating system with a 1.7 GHz Octa Core MediaTek MT6592 SoC incorporating eight ARM Cortex A7 CPUs and a Mali 450-MP4 graphics chip. This is complemented by 2 GB of RAM for efficient multitasking and 16 GB of built-in storage that can be expanded using the phone's microSD card slot. TP Friends, Cherry Mobile Selfie is now available at all CM Concept Stores, Kiosks, and partner retail stores across the country. Again, it sells for Php 9,999, which - I would say - is just right considering the phone's camera features and technical specifications detailed below.